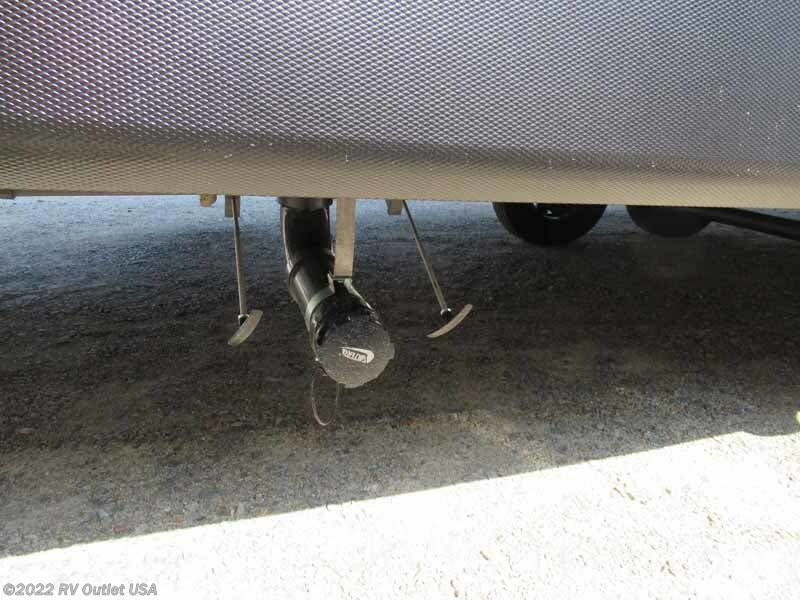 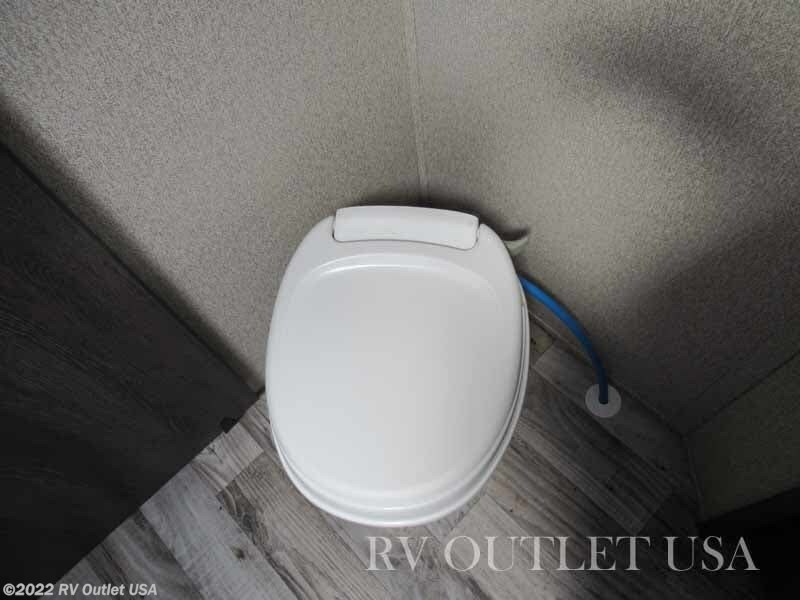 If you've been in the market for a rear kitchen travel trailer floor plan that you can pull with a 1/2 ton tow vehicle, then you seriously need to take a look at this new 2019 Keystone Outback 260UML Ultra-lite that just came in! 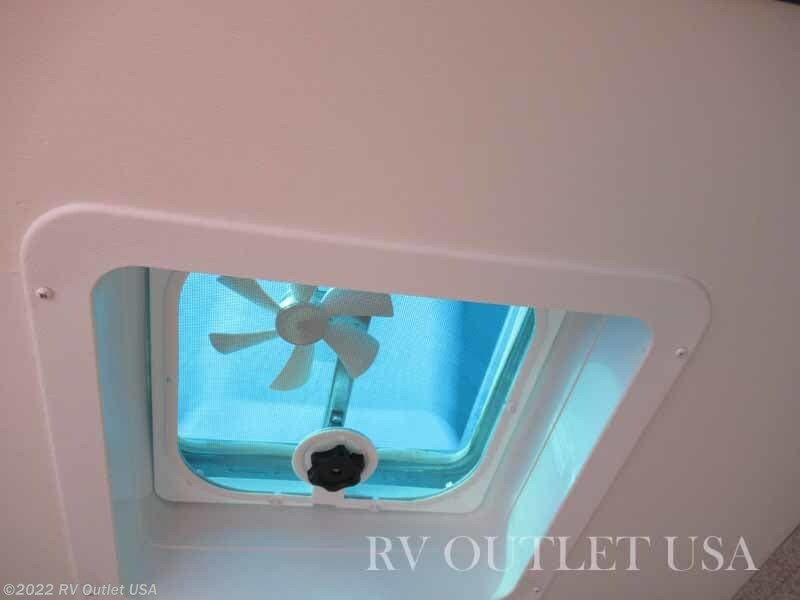 This 260UML is loaded with options and features including a power awning w/ LED light strip, a power tongue jack, stab jacks, exterior speakers and exterior light. 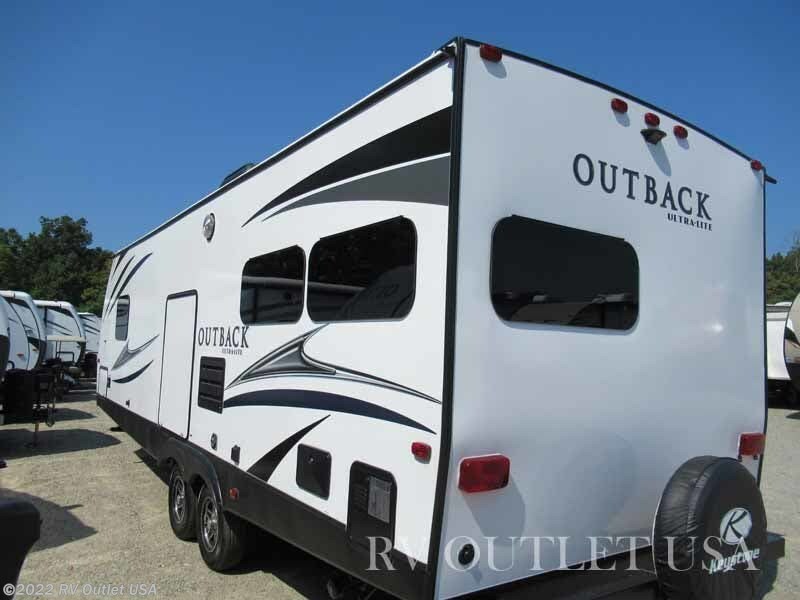 It has the upgraded tinted safety glass windows, LED HDTV, theater seating and so much more!! 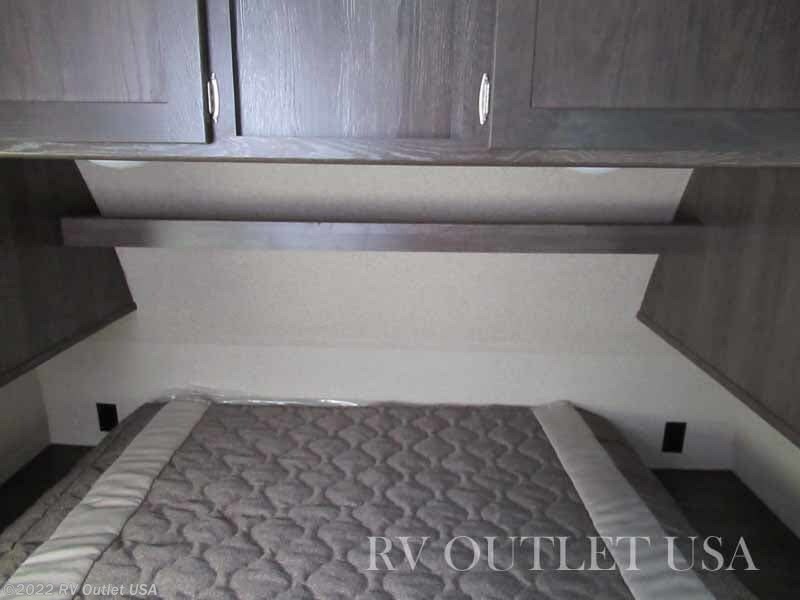 The 260UML has a walk around queen bed in the front, wardrobes on both side and over head cabinets. 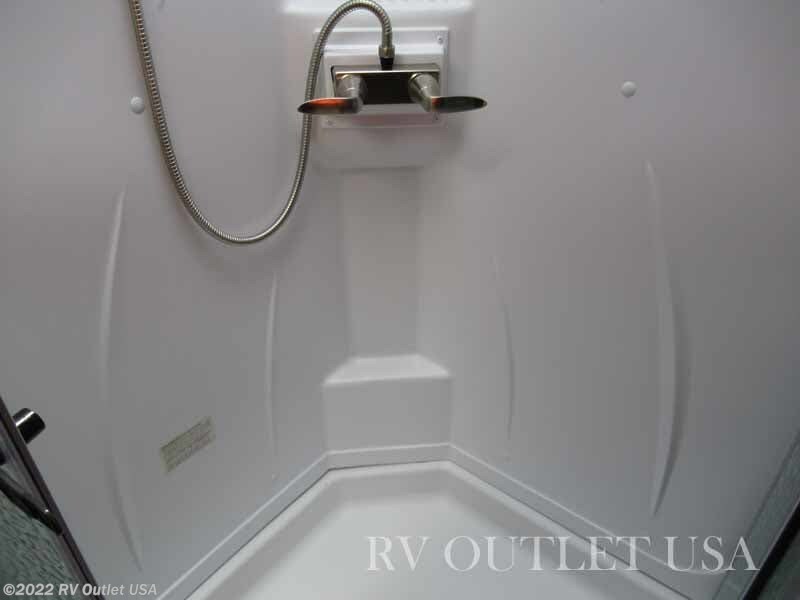 It also has a super nice side aisle bathroom with a radius angled shower with a glass surround, a foot flush toilet, a sink with underneath storage and a mirrored medicine cabinet! 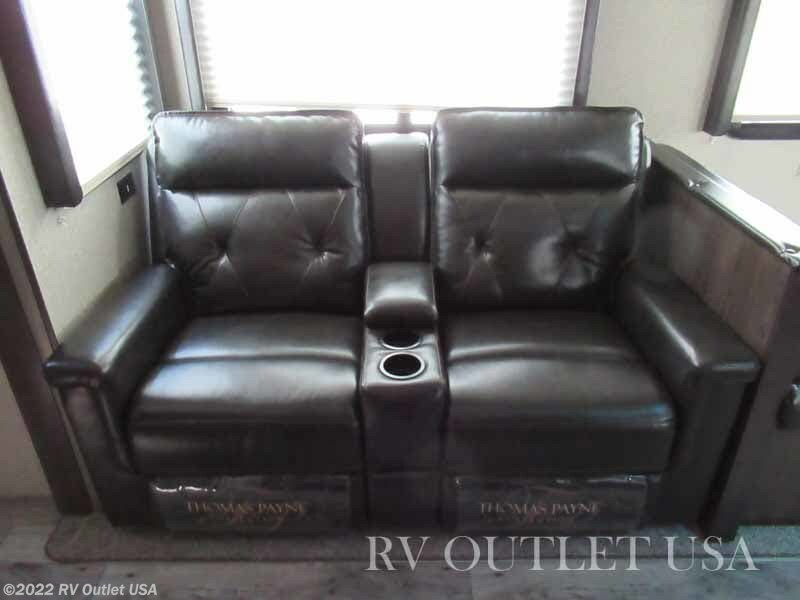 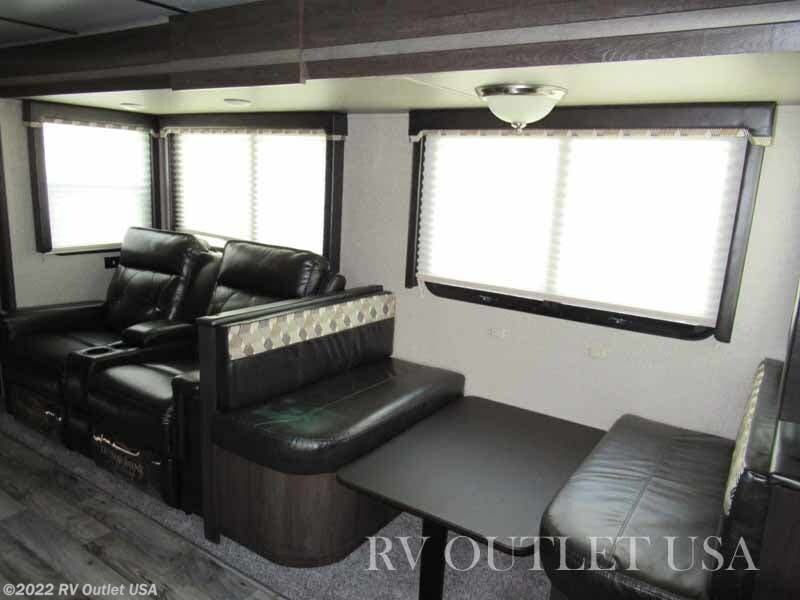 The main living area has a super slide on the off door side with a booth dinette that turns into a bed which allows you to sleep up to (4) people in this RV and Theater seating that reclines all while facing the entertainment center!! 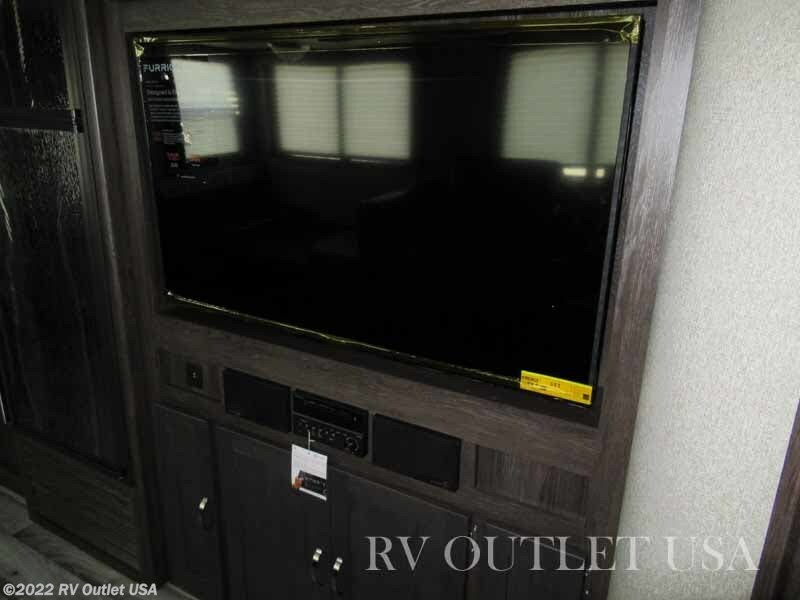 Across from the super slide is entertainment center with the LED HDTV and a AM/FM/CD/DVD player that is bluetooth enabled! 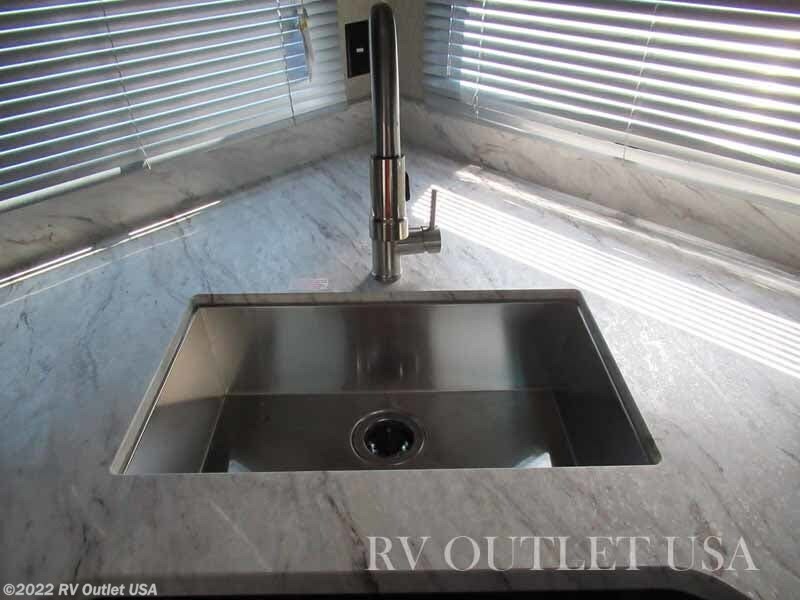 In the rear of the RV is the huge kitchen! 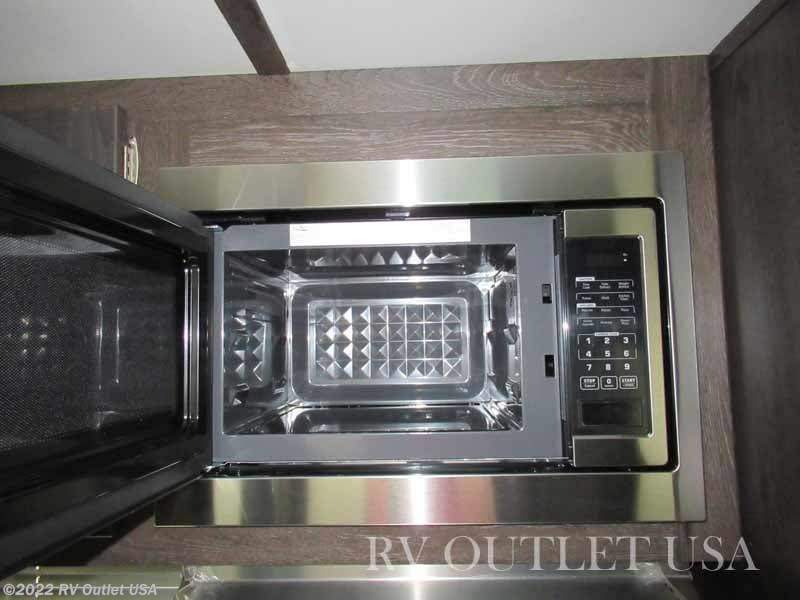 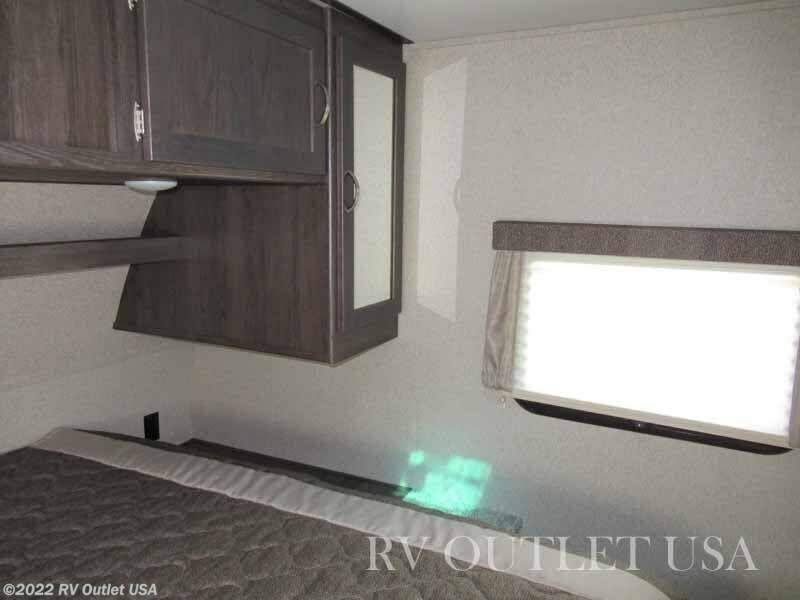 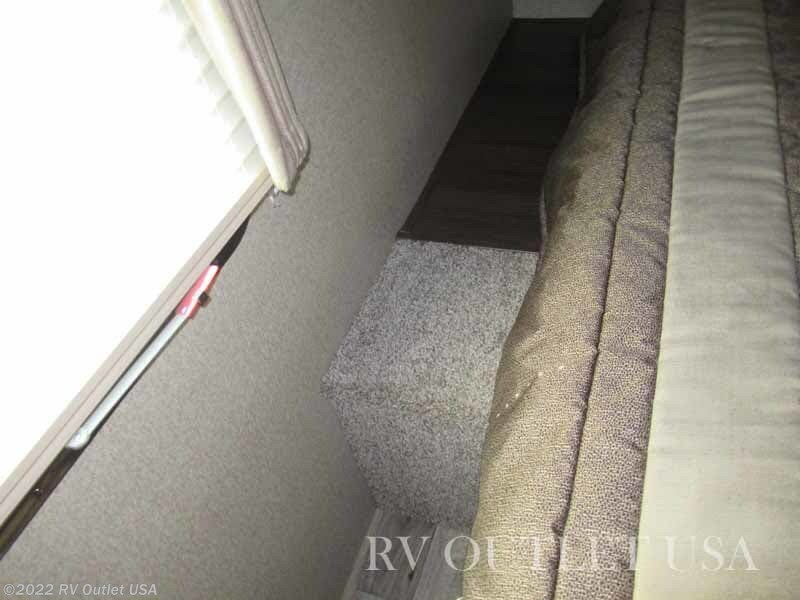 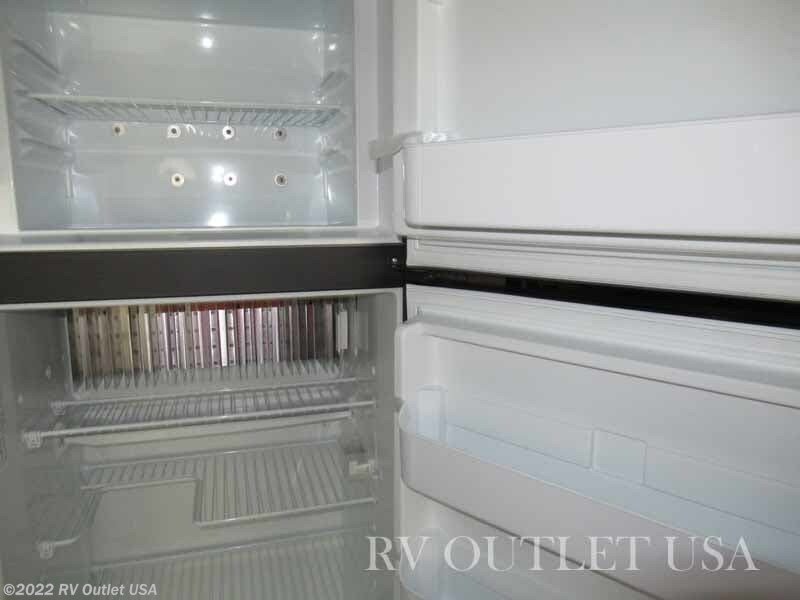 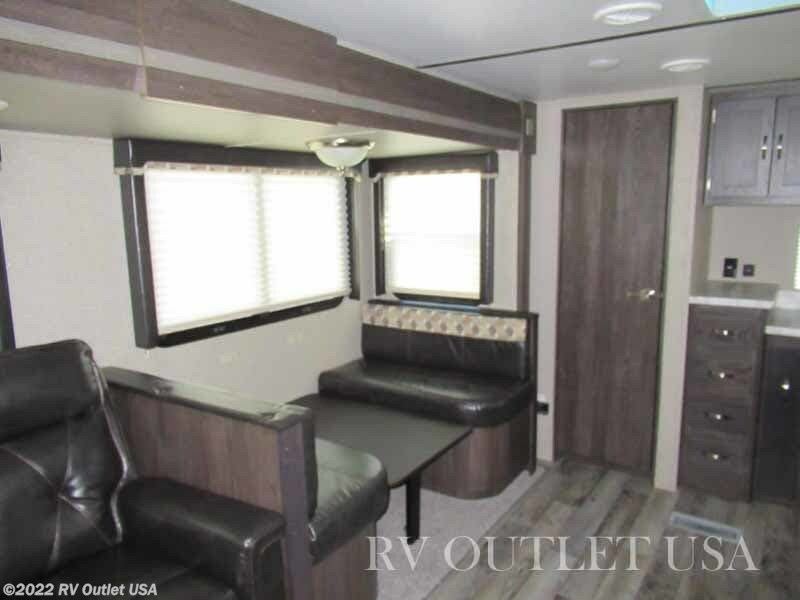 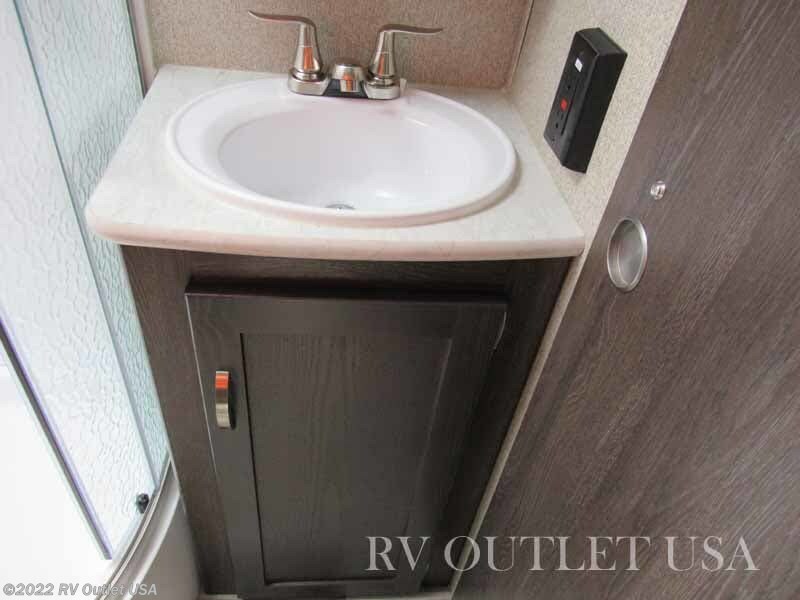 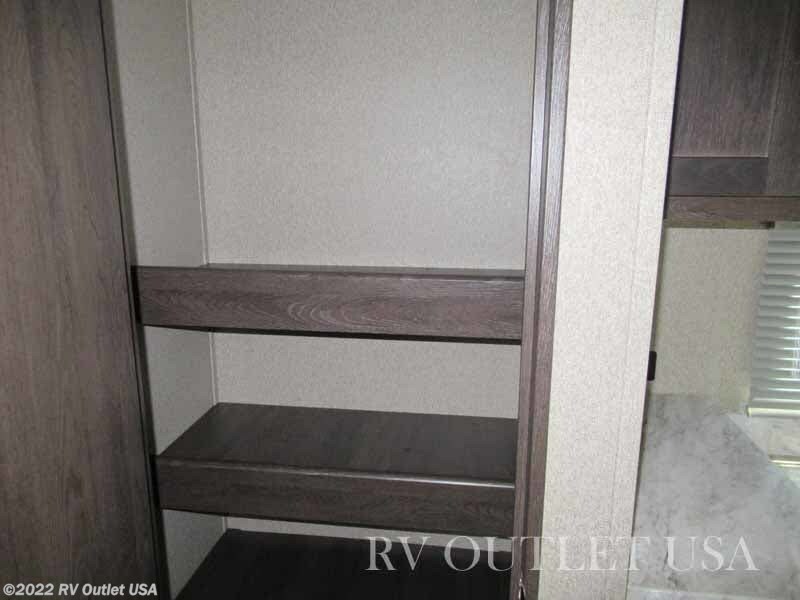 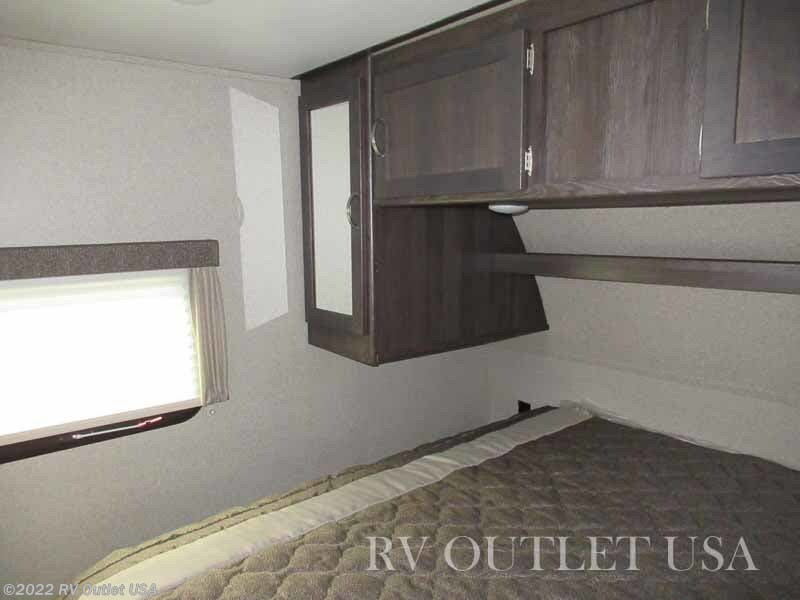 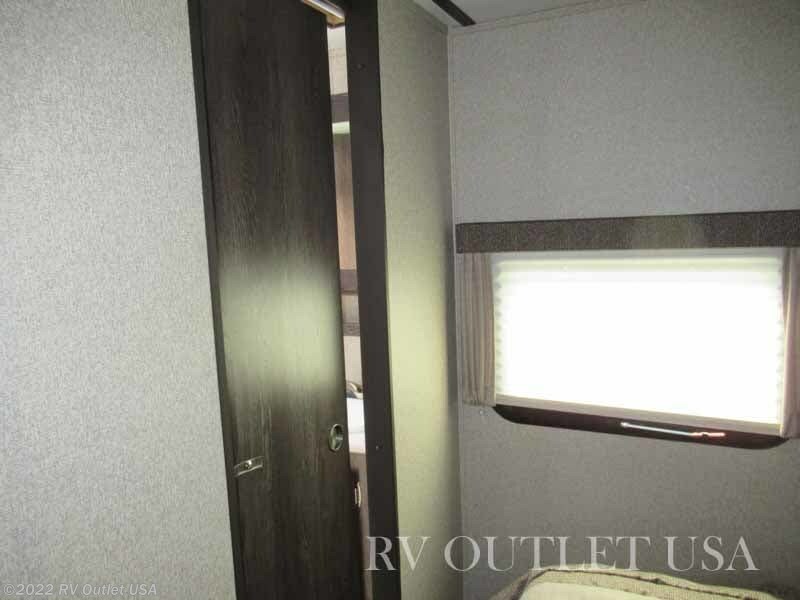 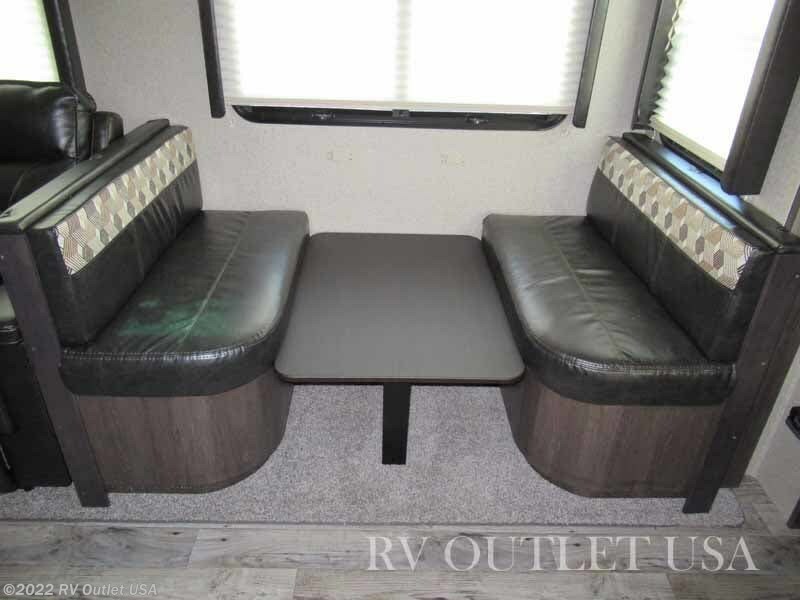 If you're looking for extra cabinet and counter top space, this RV definitely has it! 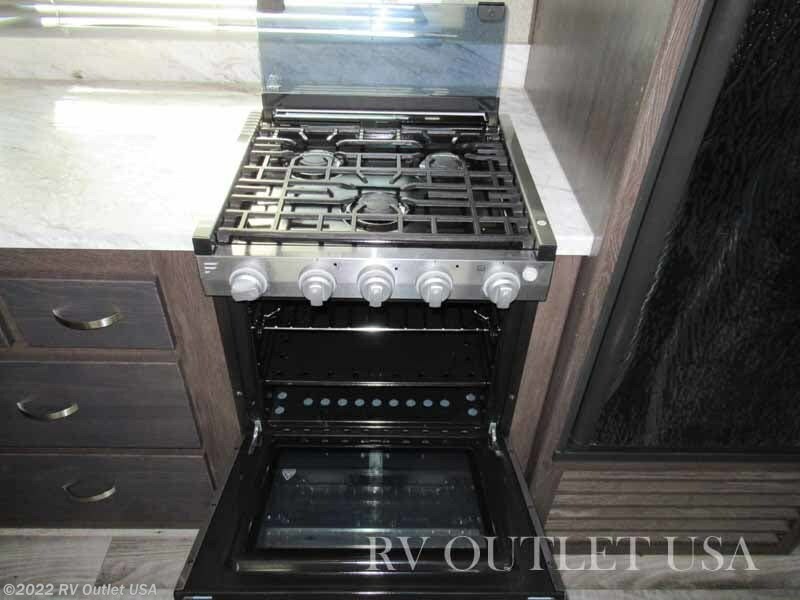 It has a double door refer, a recessed (3) burner cook top with oven, plenty of overhead cabinets, and a built in microwave oven! 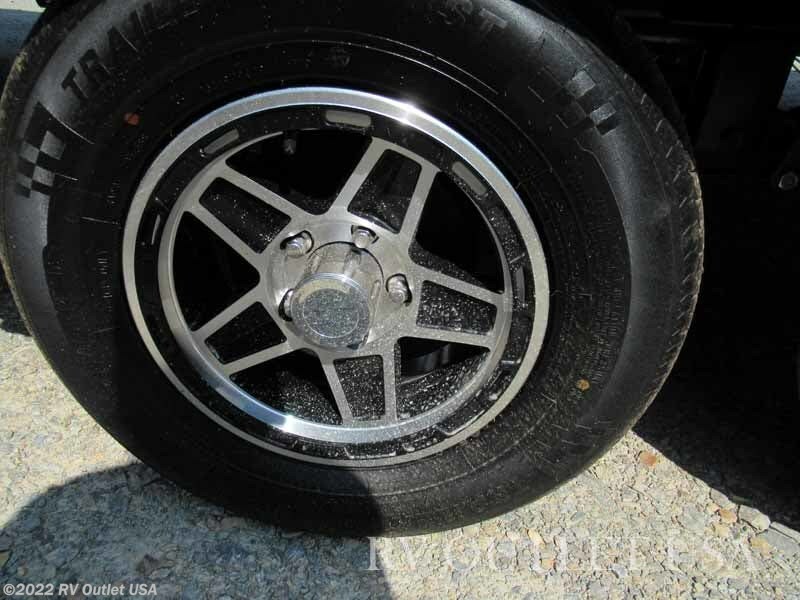 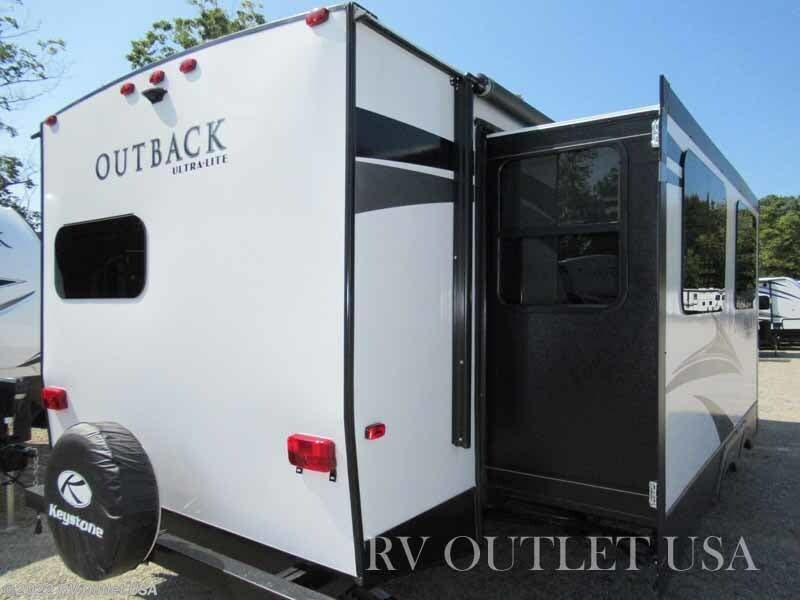 It has a ton of room inside and loaded with options! 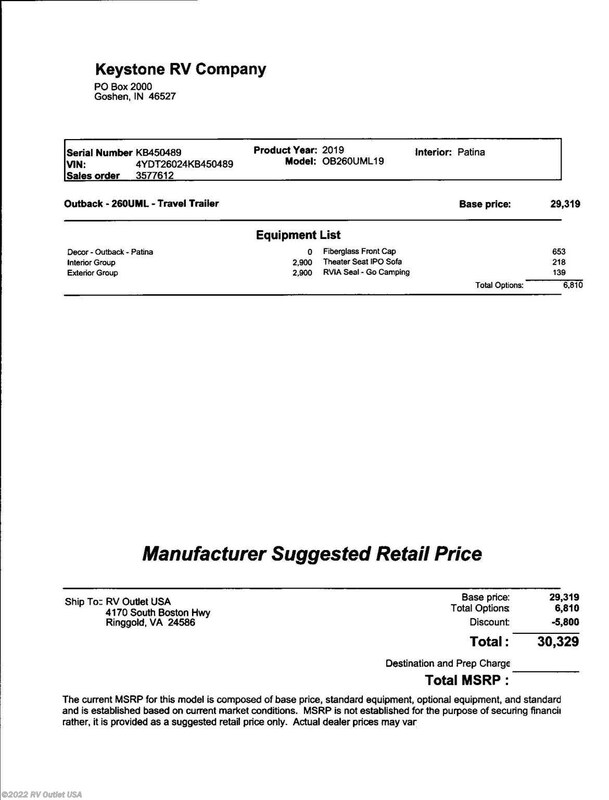 here's a list. 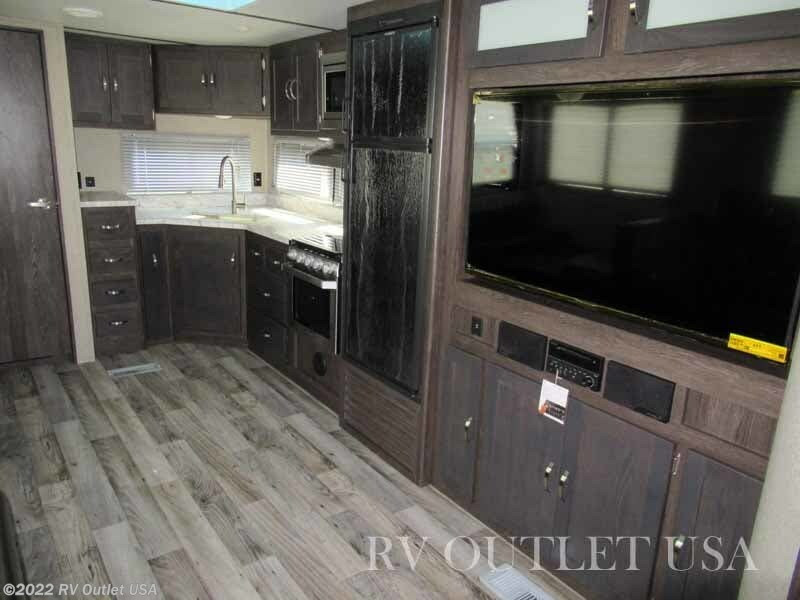 The interior color is Patina, it has the standard Outback options such as outside speakers, extra large baggage doors, tons of cabinets and storage space, radius shower, easy lube axles, a (6) gallon gas DSI hot water heater, and the heated and enclosed underbelly! 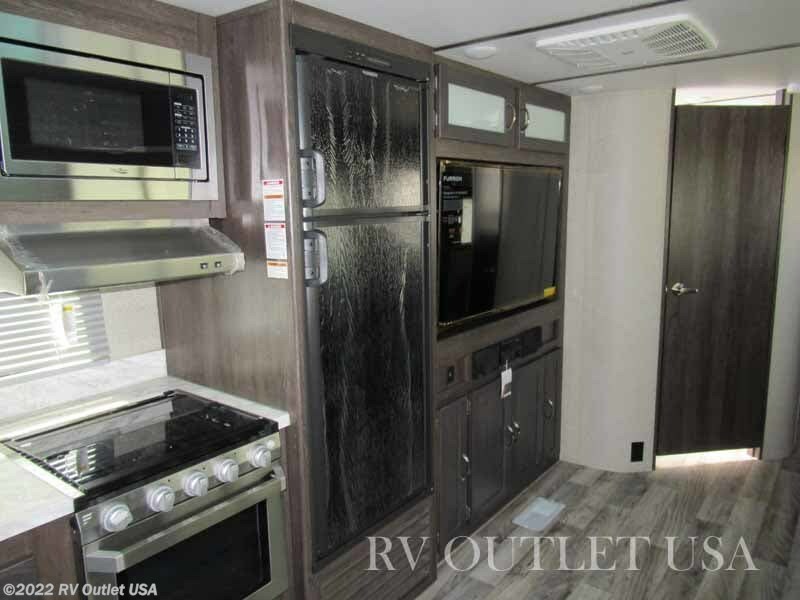 We also ordered this rear kitchen travel trailer with the interior group package and the exterior group package, which are both loaded with features! 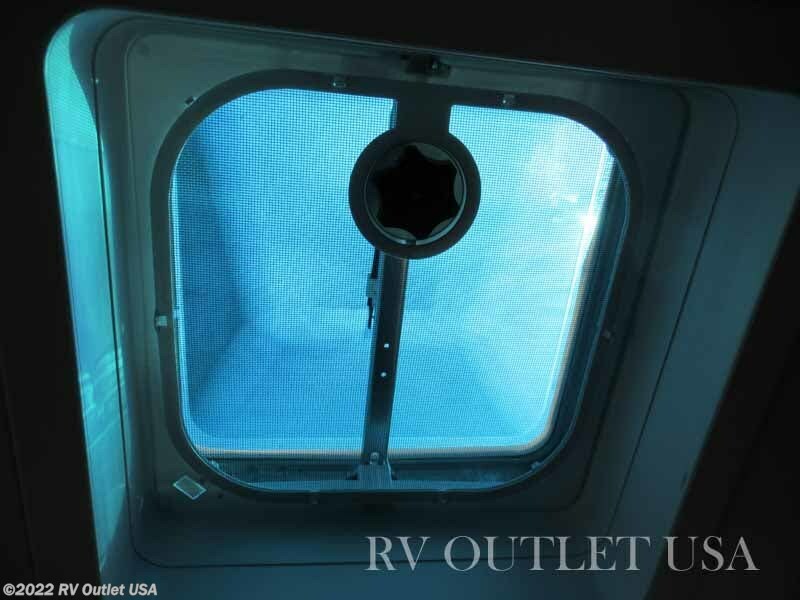 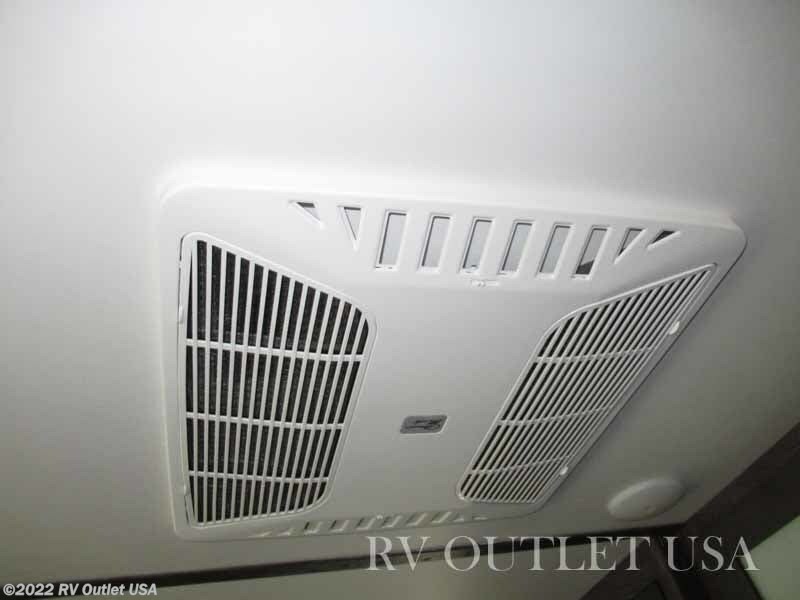 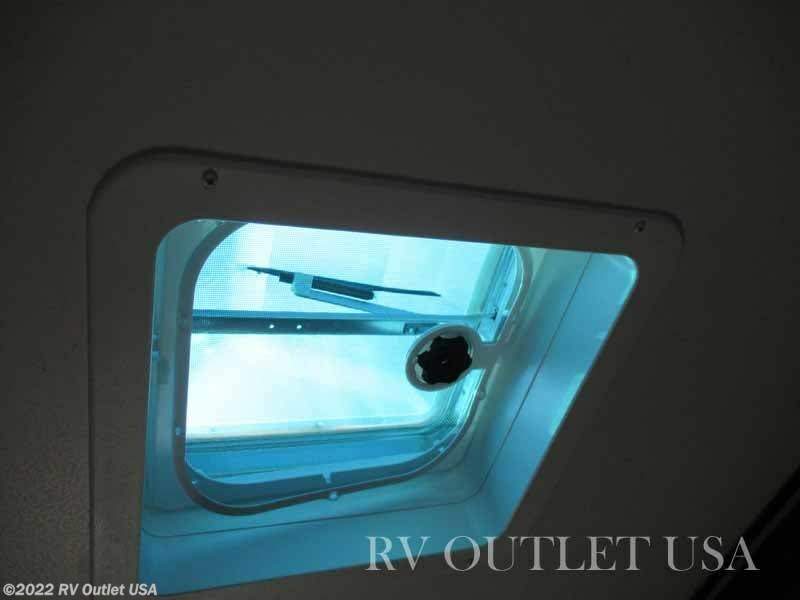 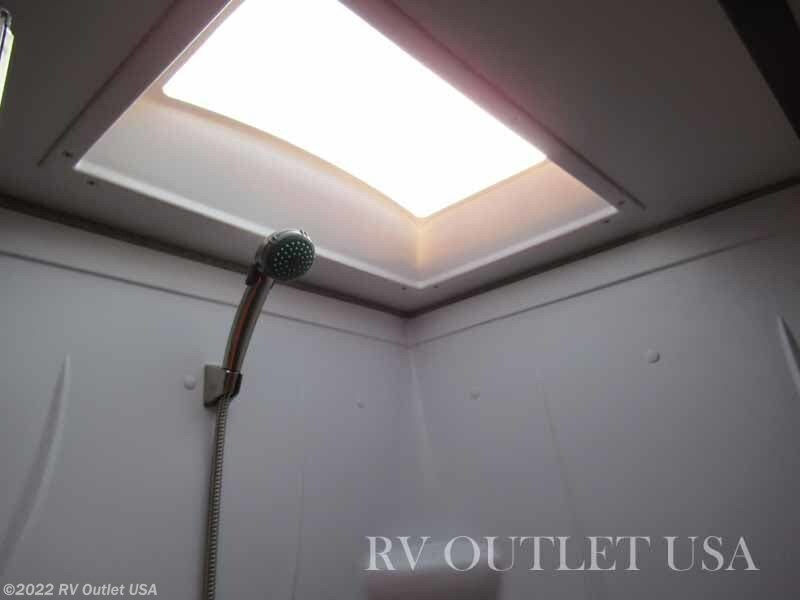 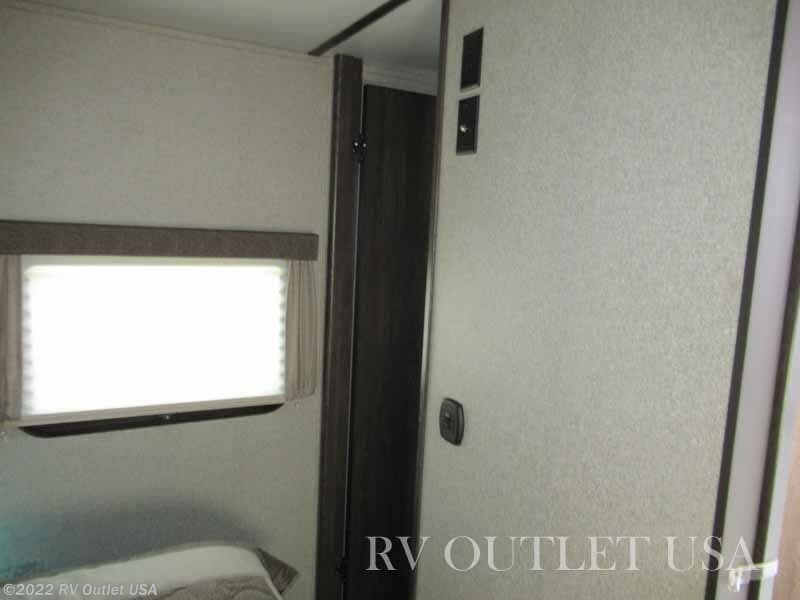 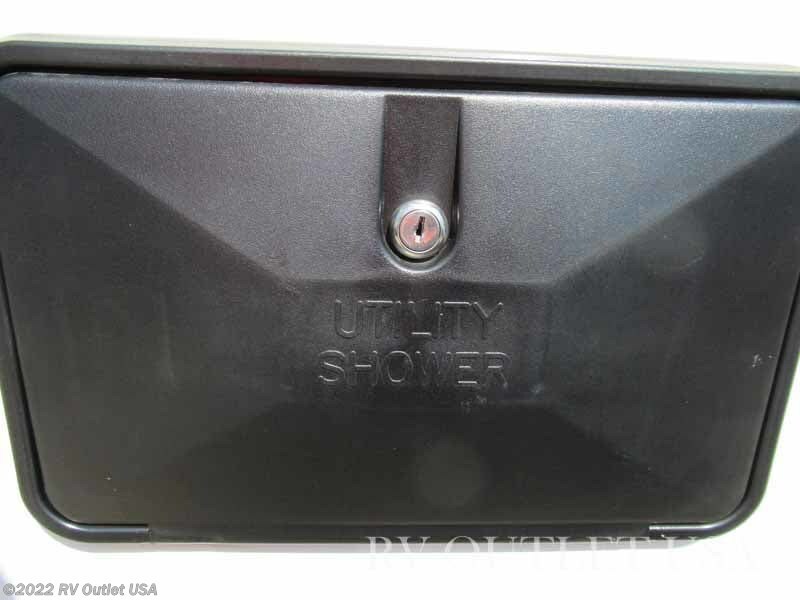 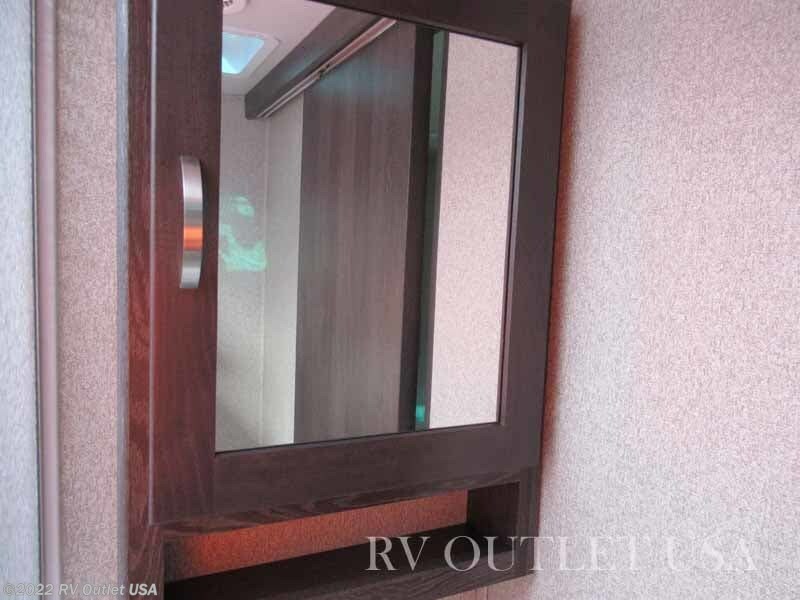 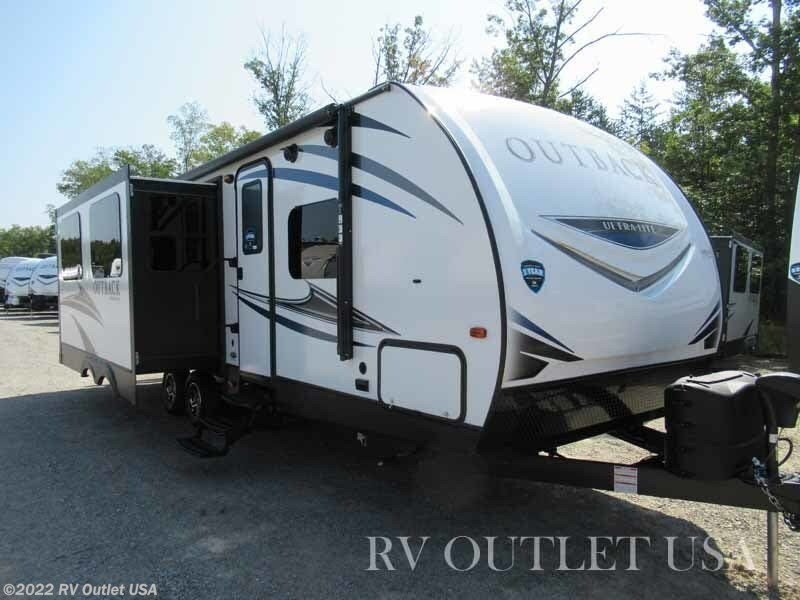 See this Stock # RVKO8424 - 2019 Keystone Outback 260UML on RV Outlet USA! 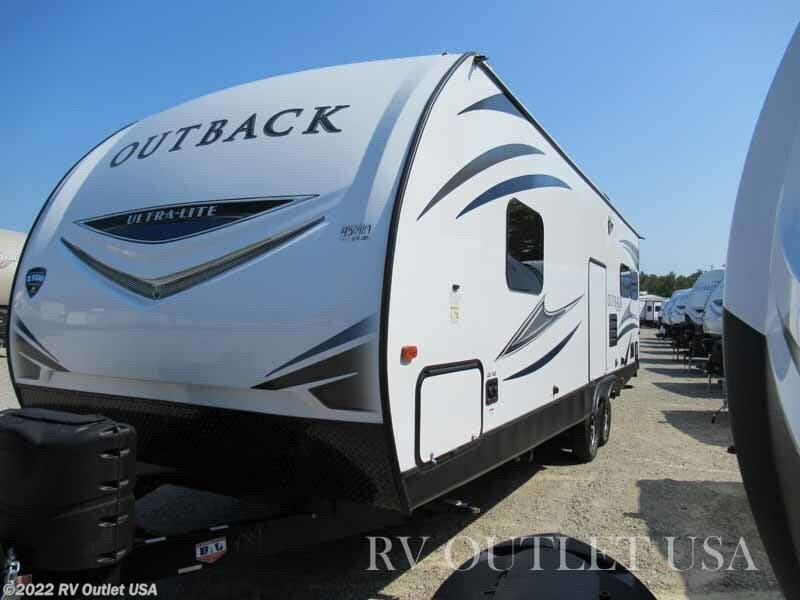 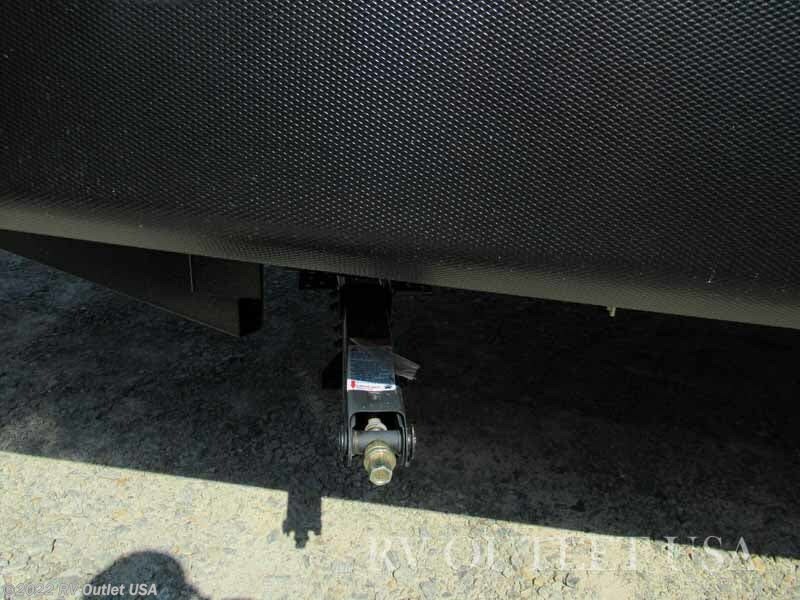 Check out Stock # RVKO8424 - 2019 Keystone Outback 260UML on keystonervsource.com!